Autism therapy is very goal and measurement oriented. We have speech goals, language goals, social goals, emotion-based goals, awareness goals, occupational therapy goals, sensory goals, and goals for our goals on the list. Honestly, sometimes it seems as if the list of goals never gets any shorter. But, as I’ve talked about in the past, autism grows up, too, as the child does so challenges change over time. And then of course, there’s the fact you never really want to master a goal because it might give someone power to take away a service or two. When we first started in-home therapy, I read the therapy log as quickly as the therapists shut the door. It was a little daily emotional roller coaster; I’d cheer the victories and would take the lower numbers personally. Eventually, I learned to calm my note reading obsession down, along with the perfectly clean and organized house when the therapists are here obsession. I still read the notes, but not as frequently, and I’ve learned that a day’s statistics are really just indicative of that day, not really the skill or task in general. Some days, Caden can identify the entire alphabet in lower case, but regularly he is stuck at 17 letters. On the flip side, he can regularly identify the entire alphabet in upper case, but will have days that he reverses his M and W and so on. Transference continues to be a struggle for us. Caden can master a skill with his therapists in the safety of the family room, but not be able to perform the same task with another person or outside of the house. For example, he is quite confident using his emotions thermometer to talk about his feelings with his therapists, but still won’t identify the color he is feeling for us without a lot of prompting (and usually tears). He can say most sounds quite well as long as they are segregated from other sounds and he is focused on only one at a time. Practice the S sound for a while, and he will then try to make every word start with the S sound, but then in regular conversation regularly doesn’t recognize that word requires the S sound. These are all struggles that we expect; they go hand-in-hand with autism. Language and interactional difficulties along with obsessive behaviors are the hallmark of most autism literature that you read. It isn’t a surprise to us that reading and other abstract concepts are a struggle for Caden while he continues to excel in the concrete subjects like math or science. We take every victory for what it is at that moment—a success. That success may not be replicated or it may become the new norm, but the focus has to be on the hard work and outcome of the moment. A personal goal that Dan and I have had from the beginning, though, is for Caden to just have the opportunity to be a kid. That was one of the driving forces behind us getting Elf, and it has continued to be a motivator for us as we make life decisions. It isn’t, however, something that is easily written into an Individualized Education Planor therapy goal sheet. “Just being a kid” isn’t something you measure or quantify as a scientific fact, so it doesn’t make its way into most planning sessions or formal settings. But as parents, with all of our heart and soul, we want Caden to be able to be a kid. We want him to have opportunities to experience and live life through the eyes of a child not the eyes of autism, anxiety, overload, or fear; just through the eyes of a 6 year old child. We don’t get that opportunity often, but when we do we treasure it for the precious gift that it truly is. On a recent trip, Caden was able to play in the swimming pool, to jump in, to swim under water, and to play with squirt guns just like his sister. Honestly, for those hours he was simply a kid enjoying the summer weather in a time old tradition just like his sister. Those moments didn’t just happen and they didn’t come easily; in fact some of you may remember the summer we spent washing Caden in our backyard because he would only tolerate water from the garden hose and wouldn’t go near the tub. In fact, you might even remember the disastrous water balloon incident from last summer’s Miracle League game. To say this moment was slightly epic wouldn’t be an overstatement and it is one that I will relive in my mind and dreams for months, if not years, to come. It is also moments like this, though, that help make the not-so-good moments more tolerable. I guess you could realistically say watching Caden play and splash in the pool offered hope that will sustain us through the next round of challenges and struggles. I hope in my heart of hearts that Caden is also able to hold onto those memories and that maybe somehow they bring him comfort and joy when the struggles of daily life try to bring him down. Maybe in his dreams he can relive those moments in the pool and simply soar as a kid. 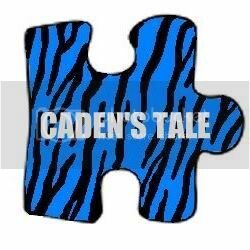 I guess more than anything I want those moments to be the norm in Caden’s Tale. A personal goal that Dan and I have had from the beginning, though, is for Caden to just have the opportunity to be a kid. That was one of the driving forces behind us getting Elf, and it has continued to be a motivator for us as we make life decisions. It isn’t, however, something that is easily written into an Individualized Education Plan or therapy goal sheet. “Just being a kid” isn’t something you measure or quantify as a scientific fact, so it doesn’t make its way into most planning sessions or formal settings. But as parents, with all of our heart and soul, we want Caden to be able to be a kid. We want him to have opportunities to experience and live life through the eyes of a child not the eyes of autism, anxiety, overload, or fear; just through the eyes of a 6 year old child. You might recall that last year we made the gut-wrenching, heart-breaking, oh-so-difficult decision to keep Caden in kindergarten another year. (Complicated Memories). We ended the last school year with tears and honestly we shed a number of tears as the new school year began. I was particularly anxious because I had promised him that if he just trusted our decision, he would end the year being able to read. I had no idea if I could keep this promise (A Promise I Want To Keep). The start of the school year was rough because Caden had watched his best friends bridge (graduate) into EI (the 1st-2nd-3rdgrade classroom), and worse yet Children’s House was very heavily weighted with more young preschoolers than kindergarteners. I’m not going to lie---we rethought our decision many days when Caden would come home from school crying. Then one day he didn’t; he had a made a new best friend and found the start of his groove. The year was a rollercoaster from start to finish. He learned to put his own clothes on and won the battle of shoe tying (sadly he is his mother’s child and his shoes don’t stay tied for long). One of his autism strengths lies in his ability with numbers and he was quickly doing math each day with the EI classroom which thrilled him to no end. He fought the long fight with the alphabet and I’m so proud to say that last night he wrote the entire lowercase abc’s for us although b and d were reversed and n failed to make an appearance. He learned to ask his friends to play, and he learned that no matter how nicely you ask sometimes they don’t want to play with you that day. He made his first phone call to a friend, rocked the conversation when his friend’s mom answered the phone, and much to his dismay he had his first kiss. He learned that sometimes people who are very close to you have to leave, and they don’t always get the chance to say goodbye. He started working with in-home therapists a LOT of hours a week, and even though it was a bitter battle, he learned to identify his emotions as one of five colors and even knows now to ask for a break or to go to his room if he needs a few minutes to regroup. He worked hard not to be so literal, and while he tries hard, we do still hear “are you a potato on the couch?” if we dare sit down on the couch. He learned empathy to the point that although he didn’t want that first kiss, he didn’t tell on her either because he didn’t want her to get in trouble. He learned how much it hurts to be bullied, and he learned that even though he is “just” a pain to her at home, his big sister is the first person to defend him when anyone else is involved. He tried to learn to use the restroom on his own, but it was just too much of a sensory overload. He did, however, learn to use the restroom in the EI classroom as well as Children’s House. He learned to say “can’t handle this,” and he learned to be the classroom monitor in case anyone was sad or just not following the rules. He learned the hard way that you really can’t run in the lunch room, and he also learned that unfortunately words like “poison” ivy or getting in trouble during the day lend themselves to anxieties and manifest as horrible nightmares most nights. He learned to hit the baseball without a T, and he learned to jump into the deep end of the pool during swimming even though he’d rather not. He learned how to adapt in karate to the parts like the staring game that he “can’t handle,” and he worked so hard to say commands that Elf could and would follow. He forged a relationship strong as steel with Elf to the point that even Elf knows their night time routine. He learned that no matter how much your heart is broken one day at school, you just have to go back the next day and try again. And maybe most important to him, he learned to read. I love the sound of his voice sounding out words in books, on signs, or on the television screen. I love the look on his face when he knows that he has correctly figured out the word. I’m so proud that he was student of the semester even if he still doesn’t what that means. On June 5, 2013 my baby boy and Elf bridged into 1st grade. This year the tale truly was about a boy and his best friend and loyal service dog, Elf. As we say goodbye to kindergarten and look ahead to first grade, I am truly thankful that Elf will be taking that next step with his boy. The start of the school year was rough because Caden had watched his best friends bridge (graduate) into EI (the 1st-2nd-3rd grade classroom), and worse yet Children’s House was very heavily weighted with more young preschoolers than kindergarteners. I’m not going to lie---we rethought our decision many days when Caden would come home from school crying. Then one day he didn’t; he had a made a new best friend and found the start of his groove.